Fab review! I actually DNF’d this one as I found it really depressing. I wonder if I should have tried it on audio instead? I dashed out and bought a signed hardback copy on publication day and you’ve guessed it – it’s still awaiting reading on my shelf! Great review, and I agree, a great book and a strong sequel. I’m glad you enjoyed this one, Cleo.It sounds as though the characters are really fully fleshed out, which is always a plus for me. I respect any author who can really make me feel what the characters are feeling. And it’s interesting, isn’t it, how certain books just work better with audio, and certain ones don’t. Wonderful review Cleo. I have never read JoJo Moyes (I’m probably the only one) and you’ve convinced me that I might be losing out. I admire any author that can really make the reader FEEL. I love when I can’t help but grab the next in an author’s books. Happy reading. I’m glad you loved this one. I’ve had it languishing on Paige (Pippa before Paige) for two years! Still unread, but if I want to continue the trilogy, I must bring it forward. Thanks for sharing. Great review. I’m so glad that you enjoyed this one. It didn’t quite work for me, I missed Will far too much. 😦 However, Jojo Moyes is one of my favourite writers. I think she’s wonderful. Fantastic review. There seem to be a lot of people who don’t rate this book but I loved it. It is a little on the depressing side but it’s just so real and completely relatable. I’ve read Me Before You and Still Me and missed this one somehow. I need to go back and read it for sure! I’ve never read JoJo Moyes but I’ve heard good things. Interesting that you like to listen to this kind of book. I find watching these kinds of movies are the only ways I can survive flying on a plane! (I’m a nervous flier). I loved Me Before You – it totally blew me away. I didn’t like After You quite as much, but I had to find out how Lousia was doing! I’m on the less popular side when it comes to this book! I didn’t enjoy Me Before You very much and I can’t say the sequel moved me either. I have no heart, haha! I am glad you enjoyed it, though 🙂 It’s a nice break from dead corpses! 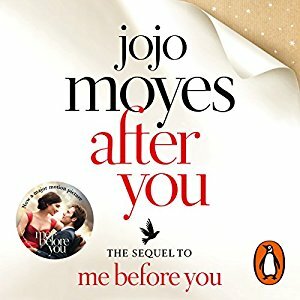 I loved Me Before You and last year read After You and Still Me. Nothing compared to Me Before You IMO but, the following 2 were decent follow-ups.